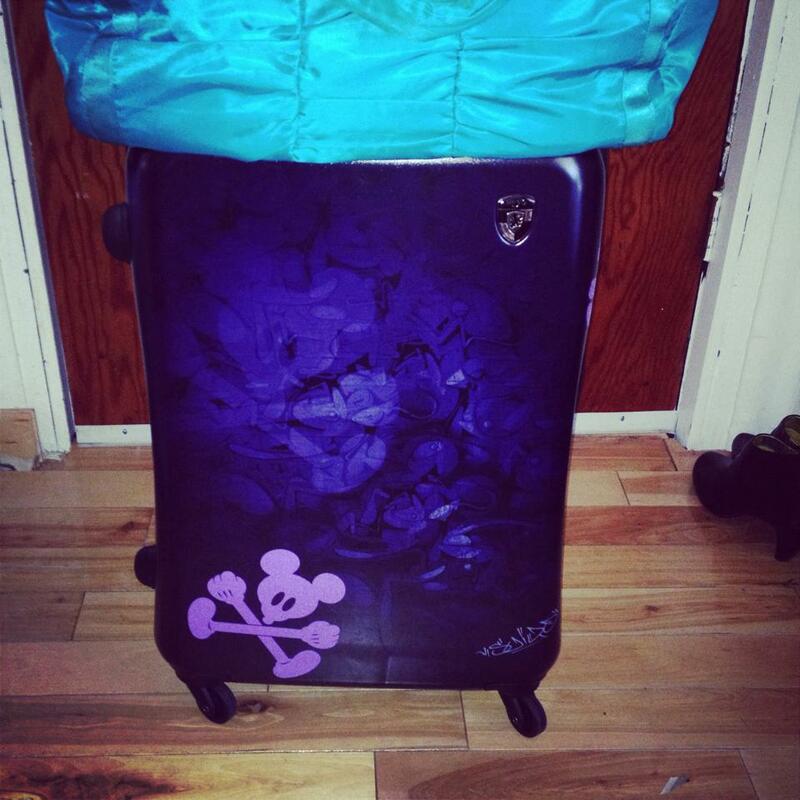 Luggage lessons – Learn from my mistakes! Why write a blog post about luggage? Well, it is an often overlooked item when planning for a trip and was almost the cause of a major meltdown on our last holiday. In preparation for our family holiday I purchased two new pieces of luggage. I’ll admit I didn’t put much thought into luggage when I was buying the first piece. I just knew that Heys was a well-known brand and it had Mickey Mouse on it, what more did I need? Can you see the faint Mickey image in the dark purple that I copied and added in lilac vinyl to stand out at the airport? I used that bag for a work trip to PEI and loved it being hard sided and the way it rolled on four wheels so when I returned home I purchased another one, knowing that we needed one more piece of luggage for our vacation. I never thought to inspect our two old pieces of luggage that we would be using as well. Mistake # 1. After 15 minutes on the road, we got off the highway at the next town so my husband could pick up an item he had forgotten from his shop. At a stop light we felt a funny bang in the back our truck. What the heck was going on? My husband got out to find a man behind us saying he had put our tailgate up for us. OMG, panic attack, had we lost anything in our drive down the highway? Were our clothes scattered all over the road? We pulled over and checked. Everything was still there, thankfully. I apparently hadn’t put the tailgate up after putting my luggage in or had put it up but the latch did not engage and it came down again. I’ll double check next time. Mistake # 2. Since we live in Canada and fly out of Syracuse, New York, surprise surprise we get snow. The airport parking lot hike (and I mean hike) with luggage being pulled along behind us through the snow led to a rather difficult and soggy journey for the two old soft sided bags, especially when one of the bags apparently had a slightly bent wheel. Refer back to Mistake # 2 – check your luggage before packing. Additionally, never buy soft sided luggage if you don’t want to deal with wet belongings. Mistake # 3. We finally made it to the airport to check in and I had a nice chat with the Jet Blue customer service lady about all the snow and heading to Walt Disney World for a holiday. All was going well until she started to check our luggage. After sending my bag down the conveyor and through the little trap door, the service rep picked up the second piece of luggage and said “I didn’t see the yellow Disney tag on the last one, oh well”. I didn’t think much of this comment until later. How could she not see a neon yellow luggage tag hanging off the handle of my bag or have not made the connection from our conversation? 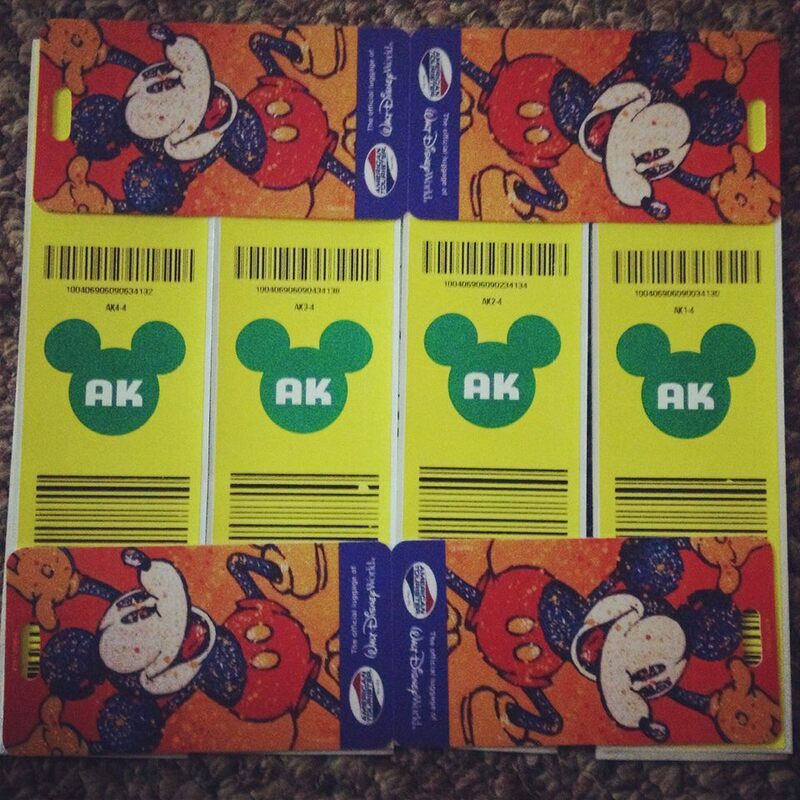 If using Walt Disney World’s Magical Express luggage tags ALWAYS specifically and blatantly point them out to your airport service rep before handing them your bags, instead of thinking they are smart enough to make the connection from your conversation or are actually paying attention and can see them. Mistake # 4. We finally made it to Orlando, checked into our room and headed to Magic Kingdom Park for some late night fun. We returned to our room at 2:30 am to find no luggage. After I called luggage services, three of our four bags were delivered to our room about an hour later. Can you guess which one was missing? Yep, mine. The one the sales rep said “oh well” about after she obviously realized she had not processed something properly for it. I won’t bore you with all the details but my bag finally showed up (about 36 hours later) after MANY calls to Jet Blue and Disney luggage services. You might think this was the end of our luggage drama for the trip but unfortunately not. For this holiday we decided to book a split stay at two resorts. On the morning of moving day we rolled our luggage to the front desk and checked out of Pop Century Resort and asked luggage services there to transfer our bags to Art of Animation Resort for us. We walked over to the new resort and checked in but it was only 9am and obviously our room was not ready. We didn’t want to hang on to our small carry-on bags, that we still had with us, until our room was ready so we checked these bags with luggage services at Art of Animation Resort to hang on to until we came back from Animal Kingdom Park. We had a fun day getting wet on Kali River Rapids and returned to Art of Animation Resort just before dinner to put on dry clothes. We collected our carry-on bags and asked about our luggage. We were told it would be in our room. Off we headed to our room only to find our luggage was not there. I made more calls to luggage services and it finally showed up. We were in a hurry to change and head out again so did not look closely at our luggage when it arrived. Mistake # 5. The last night of our holiday we were all sleeping when suddenly in the wee hours of the morning there was a knock on our door. Luggage services was trying to deliver someone else’s luggage to us. It really made me wonder where my luggage had been when it was missing. Aside from that disturbing thought, if you don’t want to be disturbed in the middle of the night make sure to put the do not disturb sign on your door. Mistake # 6. After having been woken up at whatever time that was, we all slept in and then had to hurry to check out and catch our bus back to the airport. We packed all our bags and headed out the door only to find that during the transfer from one resort to the other the wheel on the old piece of luggage that was slightly bent was now totally missing so the bag had to be carried. There was no time to complain to anyone or wait for a bell hop to bring us a trolley to load it on. Refer back to Mistake # 5 – inspect your luggage when you receive it from anyone so you can complain then if something is wrong. Thankfully there were no issues with our luggage on the return flight home. Hopefully you can learn from my mistakes but also remember, as I did, to find the humour in the unexpected and don’t let it spoil your trip. We had a wonderful time and even with all our luggage issues will not hesitate to do it all again; after I purchase two more new pieces of luggage and next time I’ll be sure to pack two emergency changes of clothes in my carry-on instead of one.